I step into a Junior High lunch room that smells like old fries and sticky plastic trays. I scan the scene—the popular kids at one table, bookworms at another, the theater crowd and the athletes and the rebels. Who will look up and invite me over? My friends and I have crushes and dates and boyfriends. We fix our hair a hundred different ways. Crowd into dressing rooms to try a thousand different outfits. Loop silver and gold through our ears. The doorbell rings and he is holding roses. I am typing into a small screen and pressing “publish.” Sending my heart in black and white into the internet. There will be comments and likes, criticisms and compliments. I watch the cursor blink. Isn’t this the whisper of our hearts as women? The friends, the men, the crowd. They will tell us if we are okay. If we are worthy. If we are enough. Isn’t that their job? But then I bump into this verse, “But Jesus would not entrust Himself to them, for He knew all people” (John 2:24). All people. The popular kids and the bookworms, the theater crowd and the athletes and the rebels. This verse has been there all along and it’s been a head-scratcher for me. He didn’t entrust Himself to them? Then suddenly it occurs to me this might the answer: Jesus is the only human to walk this spinning planet and not say Tell me who I am. He didn’t look to others to definite His identity, to determine His worth. “Instead He entrusted himself to Him who judges justly” (1 Peter 2:23). “Judge” has a reputation of being a harsh word but I don’t think that’s the meaning here. I think it’s saying that God alone knows the truest-truth and that’s why His opinion is the only one that really matters. And God says we are beloved and chosen, cherished and gifted, wanted and a divinely-shaped wonder. When someone says, “You’ll never amount to anything,” He says, “You can do all things because I strengthen you” (Philippians 4:13). When someone tells us, “You don’t look the right way,” He whispers, “You are fearfully and wonderfully made” (Psalm 139:14). When someone implies, “You aren’t wanted,” He declares, “I have called you by name, you are mine” (Isaiah 43:1b). God is the One who gives us our identities. He is the One who sets us free from condemnation and comparison, hustling to be liked and trying to be perfect. He is the One right there with us every time we feel tempted to listen to the lies. May His love always be louder than any other voice. Tell us who we are. God, You are the source of our identities. You alone give us our worth. You tell me I am loved, chosen and a part of Your plan. No matter what others may say today, I choose to believe Your Word and listen to Your voice above all. Write down one lie you’re tempted to believe and the truth that God says instead (see the lies/truths in today’s post for examples). 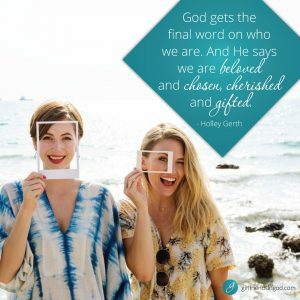 If you’d like to discover more of who God made you and what He says it’s true about you then check out You’re Already Amazing by Holley Gerth and subscribe to her weekly email devotionals through holleygerth.com. Thank you for reminding me the only opinion of me that counts is God’s. I was feeling pretty desvatated by words spoken to me by someone I love very much condemning the very essence of who I am. I needed to be reminded that God knows my heart and knows the ME He created. He gets the final word on who I am. I will not let Satan use those words to cloud the truth of who I am in God. Thank you, Holley, for sharing God’s truth with me today. Thank you for this devotional today. You have no idea how much this spoke to me. I REALLY needed to hear this today — you surely blessed my soul with message — Thank you and God bless you!